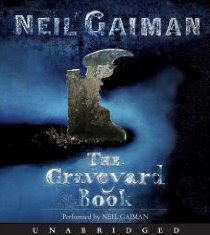 One of my favorite novels in recent memory is Neil Gaiman's The Graveyard Book. I have written some criticism on the Newberry Award winning young adult novel, but have yet to write a proper review here. Neil Gaiman writes on his blog that Bela Fleck's banjo version of "Danse Macabre" played on the audio book version of The Graveyard Book is now available on iTunes, here, for 99 cents. I am already in love with the piece, and have no doubt that I will play it on many October nights and the many times during the year when I need to remember them.